Here is exactly how users can install TWRP recovery on Samsung Galaxy S10 as well as Galaxy S10 Plus. Fortunately, developers have been able to get TWRP recovery successfully working on the new S flagship phones from Samsung. We previously covered how you can root your Galaxy S10 and with this guide, you can install TWRP recovery on it as well which is great news! Thanks to TWRP support, users should now expect to see loads of third-party development in terms of mods and custom ROMs. Use our guide ahead to not only download but also install TWRP custom recovery on Samsung Galaxy S10 and Galaxy S10+. For all Android enthusiasts, TWRP custom recovery is one must-have mod for every phone. The possibilities to customize with TWRP are endless and the added functionality mods bring are also quite amazing. For starters, a custom recovery like TWRP allows you to flash custom system files onto your phone. This can be a ROM, root, or any other mod. Further, even if you are not interested in those, built-in features like TWRP backup and advanced partition formatting make TWRP recovery a great utility on its own. To get TWRP running on your Galaxy S10 / Galaxy S10+, first backup all your data and then proceed with reading the guide completely atleast once before actually implementing it. TWRP custom recovery will allow you to install custom ROMs, advanced options like formatting the system partition, making backups etc. The entire tutorial has been given on the next page for those who want to install this custom recovery on their phones. TWRP is currently only available for the Samsung Exynos variants, which means this phone having a Qualcomm Snapdragon processor will not be able to work with this recovery. You can try flashing this recovery on a non-supported Samsung Galaxy S10 / Galaxy S10+ variant by yourself, but all at your own risk. And by risk, we mean you could easily brick your phone and this does not come under official warranty from Samsung Mobile. TeamWin is the sole creator of TWRP custom recovery. As Android is open source, the source code for TWRP is available to all developers. This means, developers can easily download the code, patch it to work on newer devices and release it. This is exactly how we have received the new Galaxy S10 / Galaxy S10+ TWRP build so quickly. You can use TWRP 3.2.3 custom recovery to flash custom ROMs, mod packages and even install root. Samsung Galaxy S10 / Galaxy S10+ Exynos Variants. To make sure you own the correct Samsung Galaxy S10 / Galaxy S10+ model / variant with the Exynos chipset, please see: Samsung Galaxy S10 / Galaxy S10+ Model Numbers / Country Variants Guide. You can also go to Settings > System > About phone on your Samsung Galaxy S10 / Galaxy S10+ to read more about your model number. 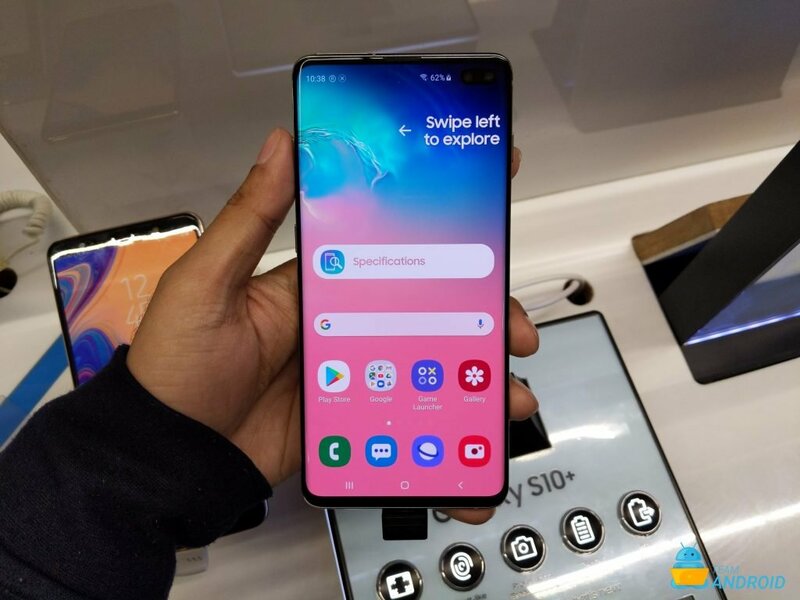 Samsung Galaxy S10 / Galaxy S10+ will be getting a huge list of custom ROMs based on Android Pie, because of its popularity and most of them are installed using CWM or TWRP. Of course, you can always enjoy the added benefits of a custom recovery with TWRP and extend your phone’s functionalities. USB Drivers: Samsung Galaxy S10 Drivers and How to Connect with Computer. Install Android Q: How to Install Android Q on Computer. Custom ROMs: For a complete collection of Samsung Galaxy S10 / Galaxy S10+ custom ROMs on Team Android, visit our Custom ROM section! Download Samsung Galaxy S10 / Galaxy S10+ USB drivers! All set and ready? Good. Now, let’s proceed with the tutorial below and update Samsung Galaxy S10 / Galaxy S10+ with TWRP 3.2.3 Recovery. There are a few backup and important tips given on the next page that you might want to read and keep in mind before proceeding ahead with the tutorial. We have put together a detailed step-by-step instructions guide for how to install TWRP 3.2.3 custom recovery on Galaxy S10 / Galaxy S10+. If you are used to installing official firmware updates through Odin on Samsung Galaxy devices, then this should not be any different for you. Please read every line carefully and make sure you read the tutorial once before actually performing it on your Android device. This TWRP recovery installation tutorial is only for Galaxy S10 / Galaxy S10+ Exynos variants. Please do not try on any other Galaxy S10 / Galaxy S10+ variants. Enable Developer Options by going to Settings > About Phone and tapping on build number multiple times. Go to Settings > Developer Options and enable ‘OEM Unlocking’. Make sure you backup all your data in your phone before proceeding as a precaution. This TWRP 3.2.3 Recovery tutorial works with Android 8.0 Oreo firmware and all future Android updates. Step 1 – Download TWRP 3.2.3 Recovery package for Samsung Galaxy S10 / Galaxy S10+ and put this file anywhere in your computer. Also, download the Encryption Disabler script ZIP package — this needs to be placed on the external SD card on your phone. For now, it cant be flashed through internal storage. NOTE: Make sure you select the appropriate file above for your Galaxy S10 / Galaxy S10+ model. Step 2 – Download Odin which will help you to install TWRP Recovery on Samsung Galaxy S10 / Galaxy S10+. Step 4 – Make sure you have your Samsung Galaxy S10 / Galaxy S10+ USB drivers installed on your computer. Step 5 – Open Odin on your computer. Connect your phone to your computer while your phone is in the Download Mode. Step 6 – If your phone is connected successfully, one of the ID:COM boxes will turn yellow with the COM port number. This step might take some time. Step 7 – Now select the correct file with respect to your device that you have to flash/install on your phone. This file is the same as you downloaded in Step 1. Click on ‘PDA’ / ‘AP’ and select the TWRP package file you downloaded in Step 1 for your phone. Step 8 – In ODIN, uncheck the Auto Reboot and check F. Reset Time options, if not already. Step 9 – Now click on the Start button in Odin. Installation process will start and would take a few minutes to complete. Step 10 – After the installation is completed, you should hold your Power Button and Volume Down Buttonuntil the screen turns black. Step 12 – Now, from TWRP flash the ZIP file you downloaded in Step 1. Step 13 – After that, select reboot from TWRP. That’s it! Your Samsung Galaxy S10 / Galaxy S10+ has now been flashed with TWRP 3.2.3. Please take a look at the following tips and important points you need to take care of. These are important, as we don’t want anyone losing their personal data or apps. Always backup your important data that you might need after you install a new custom ROM, an official software update or anything else. Make a backup for just in case, you never know when anything might go wrong. Read: How to Backup Android Apps, Text Messages, WhatsApp, Call History. 1. Having problems connecting your Android phone to the computer? You need to enable USB debugging mode. See here: How to Enable USB Debugging — for Gingerbread, Ice Cream Sandwich, Jelly Bean, KitKat, Lollipop, Marshmallow, Nougat and Oreo. 2. Make sure your Android device is charged up to 80-85% battery level. This might help you: How to Check Battery Percentage. Why? Because, if your phone goes off suddenly while installing a custom ROM, flashing an official firmware update or installing mods etc. — your phone might get bricked or go dead permanently. No one wants that, right? 3. Most of the tutorials and how-to guides on Team Android are for factory unlocked Android phones and tablets. We recommend not to try our guides if your phone is locked to a carrier, unless we have specified the carrier name or device model. If you run into any problems, feel free to drop us a comment on our Facebook, Google+ or Twitter and we will reply you back ASAP with the fix or the solution to your problem.